Sofie Pelsmakers is a chartered architect and environmental designer with more than a decade of hands-on experience designing, building and teaching sustainable architecture. She taught sustainability and environmental design and led a masters programme in sustainable design at the University of East London and at the Sheffield School of Architecture. She was a doctoral researcher in building energy demand reduction at the UCL Energy Institute. She is currently an Assistant Professor at the Aarhus School of Architecture in Denmark and co-founder of Architecture for Change, a not-for-profit environmental building organisation. She is author of ‘The Environmental Design Pocketbook’(2012 & 2015), which synthesises her practical and academic expertise to support the building industry towards a significant change in its design and building practices. The book is published by RIBA Publishing and received commendation for the RIBA's 2012 Presidents Awards for Outstanding Practice Based Research. 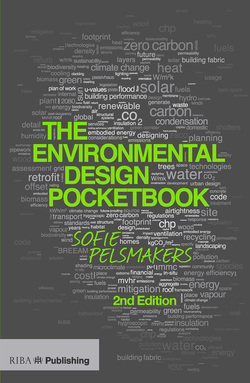 The Environmental Design Pocketbook has received commendation for the 2012 RIBA President's Award for outstanding practice-located research (31.10.12) and its author, Sofie Pelsmakers has been listed among 20 'Women influencing Sustainable Architecture' by the Architects Journal and as 1 of 100 top Twitter influencers in sustainable construction, design and the built environment by EcoBuild and in BD's top 10 most nominated and in top 10 Sustainability tweeters by BD. Sofie was 'highly commended' for the UKGBC/PRP 2013 inaugural Rising Star award (March 2013) and was listed as 1 of 13 Stars of Building Science in Building 4 Change's Virtual Academy of Excellence (Sept 2013). The 2nd edition of her book, The Environmental Design Pocketbook was published in December 2014. You can read reviews of both editions here. This is her blog, or rather a collection of musings & articles sometimes also published elsewhere.